In this year’s State of the Union, President Obama touted the fuel efficiency of cars as a way to promote the advance of American energy and an indication the country is on its way to reducing reliance on foreign resources to power our main mode of transportation. It’s no secret the White House has led a crusade to make cars more fuel efficient, no matter the cost to the car enthusiast or common sense. But in a column written Friday by Brad Plumer of The Washington Post, a study from MIT claims that increasing the federal gas tax from 18.4 cents to 45 cents is actually more effective in reducing fuel consumption than making cars more fuel efficient – at least six times as effective, in fact. The thought behind the study actually makes sense. People aren’t going to change driving and commuting habits as long as they believe they can continue practicing their driving habits, uninterrupted by high fuel prices, because they drive a more efficient car. This is why California’s best-selling car is the Toyota Prius and why I get cut off by one on an almost-daily basis. That’s huge when you think about all of the sacrifices those of us who actually like to drive are making as companies try to meet the CAFE standards being phased in. Eco-minded transmissions and gearing, low-displacement engines, turbochargers replacing cylinders, stupid driving modes that don’t really work in any setting, the list goes on. It’s why even BMW M cars have stupid Efficient Dynamics stickers on them, why V8-powered Mercs have BlueEfficiency badges on them. It’s why we have to deal with these insipid CVTs and frustrating automatics that seem to require sequestration to get them into a lower gear. 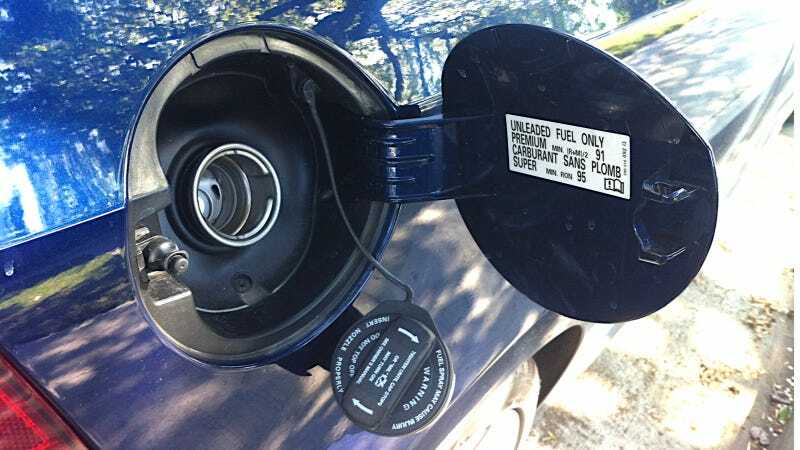 Plumer’s point, which I completely agree with, is that the higher fuel economy standards being so heavily touted are full of hidden costs that present probably a softer blow to consumers than markedly higher gas prices. You drive by gas stations practically every day, but how often is the average consumer looking at car prices? Will they notice that the price a Hyundai Sonata has noticeably increased over the course of a few years when they go back to the dealership to buy another? Also worth considering is that a hike in the federal gas tax may actually improve roads in this country, which to put mildly, are developing nation-grade in a lot of places. I like to drive, and if you’re reading this you probably like to also. When I was out of high school, unemployed and paying about $75 to fill up the tank on my Saab, I decided it was worth it to go for a good drive rather than go to the movies or Starbucks or whatever I was doing back then. People who love cars and love driving will find ways to pay for their addiction. We should be allowed to buy new performance cars that haven’t been muzzled because of a need fuel economy or 9 ways to monitor how much fuel you’ve used and how many leaves you can get on the dashboard. And people who hate to drive and yet get in their Toyota Prius Vs 62 times a day because they can’t plan their trips properly can think twice about their decision.